The VE3UHM DMR repeater in Hamilton, ON, joined the DMR-MARC Canada network on February 15, 2015. On February 15th, DMR coverage in the greater Toronto area just got even more amazing with the debut of the VE3UHM DMR repeater in Hamilton, ON. 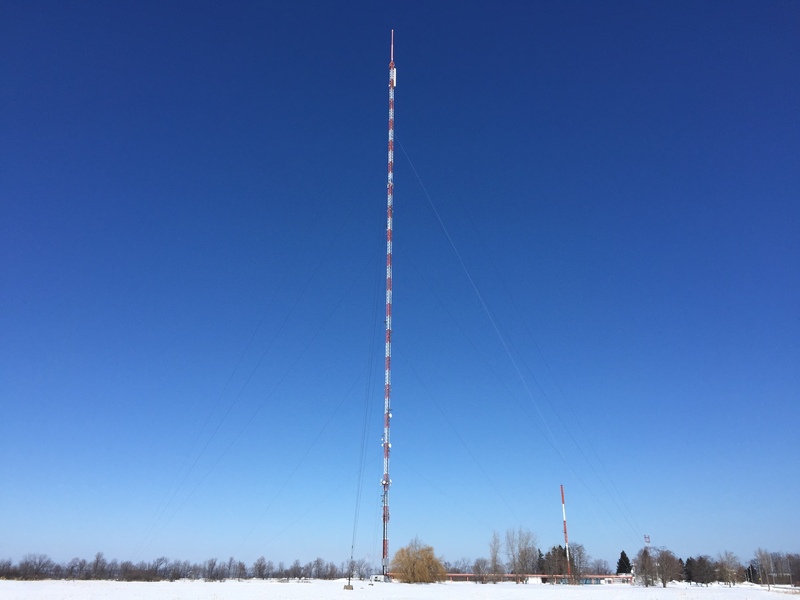 The VE3UHM DMR repeater, which is located on a 305 m (1,000 ft) broadcast tower in the southeast area of the city, joins VA3XPR to become the second wide-coverage area DMR repeater to join the DMR-MARC Canada network in the greater Toronto area. With its impressive height, the VE3UHM DMR repeater will be able to provide reliable coverage from Buffalo, NY to the east, Woodstock to the west, Richmond Hill to the north and Erie, PA to the south, as outlined in the below coverage map. 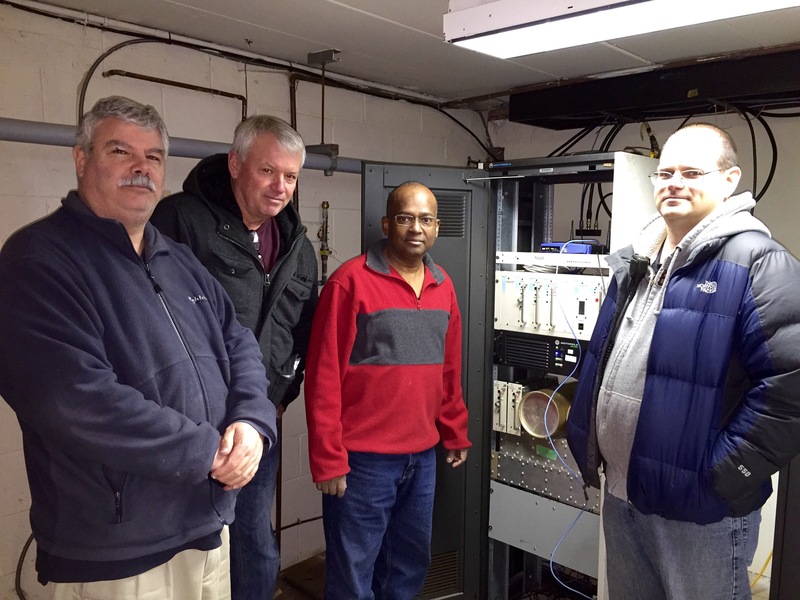 The installation team for the VE3UHM DMR repeater. From the left, Jon Rorke, VA3RQ, Rick Reemeyer, VE3RNK, Philip Anderson, VE3SSV and John McKay, VA3BL. Not shown is Stéphane Ricard, VE2TAX, who helped make the connection to the network possible. Photo taken by Don Trynor, VA3XFT. 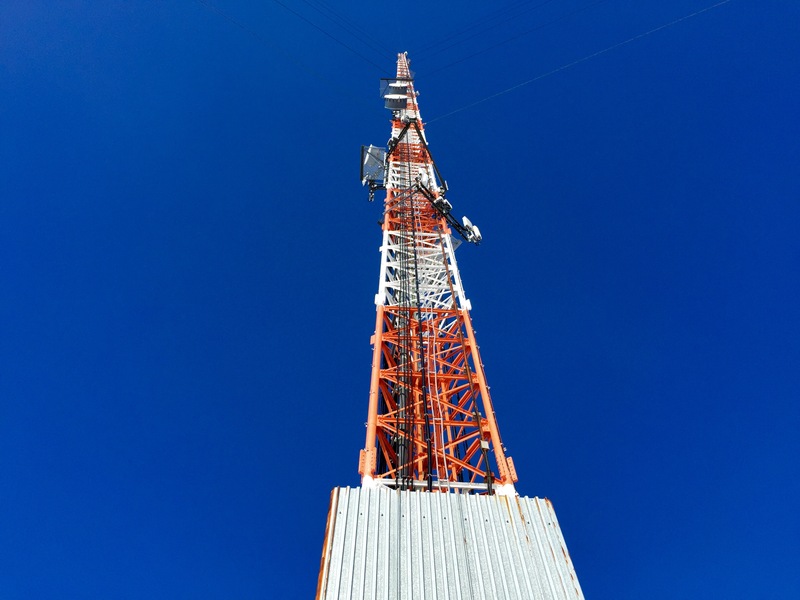 Sponsored by a team of hams from Hamilton and the surrounding area, the VE3UHM DMR repeater first came on the air during the Christmas holidays, however remained as a stand-alone repeater for about six weeks until the network connectivity could sorted out. The VE3UHM DMR repeater joins other existing repeater systems at this location, including two FM repeaters (VE3UHM on 70cm and VE3OBP on 2m). The tower for the VE3UHM DMR repeater. At 305 m (1,000 ft), VE3UHM will be able to provide impressive DMR coverage around the greater Toronto area and as far south as Erie, PA.
To facilitate local communications in the greater Toronto area, the Local talkgroups (TG2) for VE3UHM and VA3XPR will be interconnected, providing a convenient place for hams in the GTA to keep in touch. The talkgroups available on the VE3UHM DMR repeater will mirror those available those available on VA3XPR, which can be found on the VA3XPR website. A special thanks to Stéphane Ricard, VE2TAX, for his help in configuring the c-Bridge to make this connection possible. The VE3UHM DMR repeater can be accessed on the frequency 442.6750 MHz (+5.0 MHz offset) with a colour code of 1. The expected coverage map for the VE3UHM DMR repeater, located in Hamilton, ON. Green is strong signal areas and yellow is weak signal areas. For more information about DMR, check out the DMR page.